The Wissahickon is one of my favorite spots - to hike, to bike on Forbidden Drive with my kids, and especially to do wedding and engagement shoots. I’ve done engagement sessions on some of Philly’s best hiking trails, photo shoots beneath the Henry Avenue bridge, and a number of weddings along Forbidden Drive, right next to the Wissahickon Creek. My calendar was pretty packed with weddings - fall is the busiest time of the year for me… and I love it! Even though I had a jam-packed schedule, when Marissa reached out to me after seeing my wedding photos on Instagram about photographing her wedding ceremony and reception at the Valley Green Inn in the beginning of October, I was so grateful to have had that date available. The leaves changing color in the fall, next to the Wissahickon Creek and the expansive Forbidden Drive, provided such a beautiful backdrop for the photos. Little did I know that one of the photos would end up in the New York Times...but more on that later! I met up with Marissa and her three bridesmaids at the Valley Green Inn. Having a smaller bridal party makes photos a little bit easier and gives everyone more flexibility to move around and have fun with different bridesmaid poses. We took the classic photos with the Wissahickon Creek in the background, and made sure to pose in front of the absolutely stunning arch designed by Events by Organized Chaos - the seasonal flowers and garland made the scene even more amazing. Forbidden Drive was recently named Pennsylvania’s Trail of the Year - the huge packed gravel road that winds through the Wissahickon is packed with bikers, runners, and dogs, which was really awesome to see, but also made my job even more interesting, dodging all the Philly fitness enthusiasts to get the perfect shots in the middle of Forbidden Drive! Not to mention that there was a group of 50+ people from a Philly run club that ran through the wedding guests right before the ceremony began… Forbidden Drive certainly keeps things interesting! Marissa and her bridesmaids were a ton of fun, but the real excitement came when Baloo arrived with the groomsmen. Baloo is Marissa and Sean’s American Bully who they rescued two years ago, and because they’re absolutely obsessed with him (their words, not mine! ), his involvement was a must on their wedding day. Shooting a group of taller guys alongside a very short dog made things interesting, but the groomsmen were more than willing to get low to pose with Baloo. 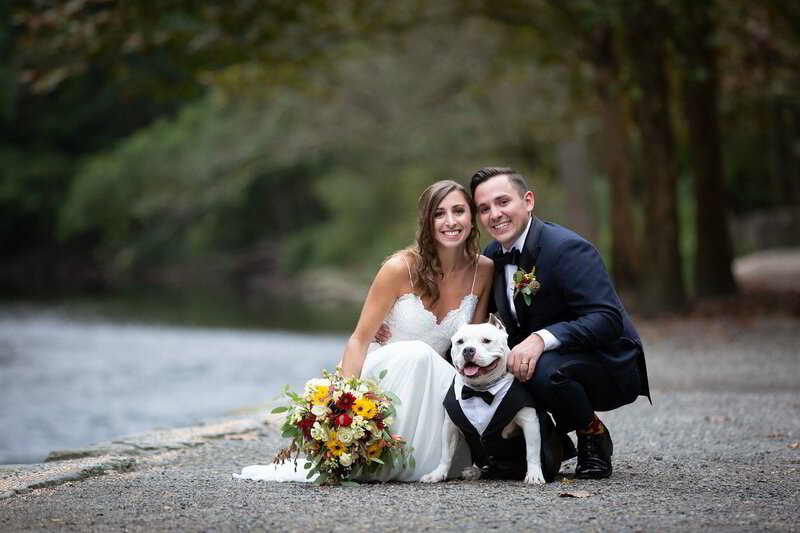 This photo, along with a write-up of Baloo’s impeccable skills as a groomsmen for Sean, were featured in a recent New York Times article on Pet Weddings! When Marissa texted me two months after their wedding day with the link to the article, I was completely astounded. Their wedding day couldn’t have gone better, but this just made everything even more incredible. "Our wedding day could not have been more perfect, and we are so impressed with Damon's photography. He worked with our bridal party and families, organizing posed photos (and working quickly against the deadline of sunset for our outdoor shots, too!) and took the best candid photos at the reception. Would 100% recommend Damon for wedding photography - he's amazing!" Marissa and Sean didn’t do a First Look, as they wanted the first time they see each other to be when Marissa walks down the aisle, and I loved being able to capture the first moment Sean saw his bride. The ceremony along Wissahickon Creek, complete with a sand ceremony and a reading from A Man Called Ove, was perfect, and Marissa and Sean couldn’t stop smiling. Like I’ve been saying, the Wissahickon is amazing, but because it’s in a valley, and because it was 6 p.m. in early October, the sunlight was not going to last much longer, and I knew Marissa and Sean wanted to get photos outside in the daylight. Right after the ceremony, I reminded Marissa and Sean that we had only about 30 minutes of sunlight left, and they were so glad that we hustled - this is one of my favorite photos of Marissa, Sean and Baloo, and the lighting, background, and scenery made for a perfect family photo! The best part about weddings at the Valley Green Inn is that you feel like you’re outside and inside at the same time, which is exactly what Marissa and Sean wanted when they were picking a Philly wedding venue. Cocktail hour fanned out onto Forbidden Drive, and throughout the reception there were guests hanging out on the porch, corn hole and games happening outside under the tent, and a nice breeze coming through the wedding venue. The guests all had a blast at the reception, and I did too! Marissa and Sean’s smiles never left throughout the whole evening, and being able to capture these first moments for them as husband and wife was wonderful.